AMY GOODMAN: We’re broadcasting from Boston. Today we spend the hour with Noam Chomsky, who visited his hometown of Boston this week, where he was a professor at the Massachusetts Institute of Technology for more than 50 years. He now teaches at the University of Arizona in Tucson. Over 700 people packed into the Old South Church Thursday to hear the world-renowned dissident and father of modern linguistics speak about threats to democracy, from the issue of Israel-Palestine to the arrest of Julian Assange, from nuclear war to climate change. 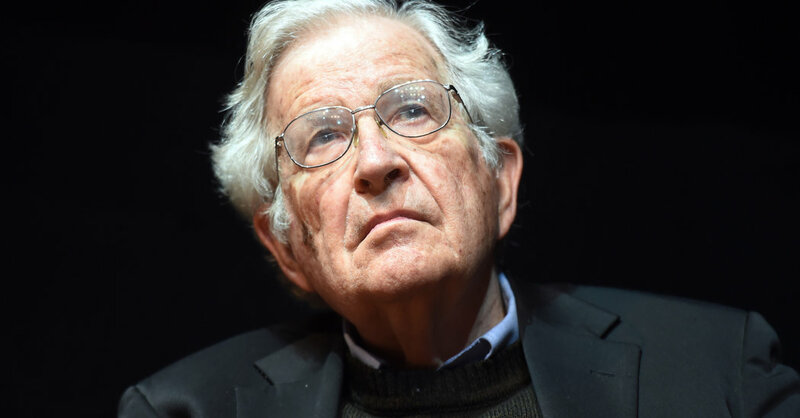 After viewing part of a new film about him called Internationalism or Extinction, Noam Chomsky talked about the past two years under President Trump. NOAM CHOMSKY: If you’ll indulge me, I’d like to start with a brief reminiscence of a period which is eerily similar to today in many unpleasant respects. I’m thinking of exactly 80 years ago, almost to the day, happened to be the moment of the first article that I remember having written on political issues. Easy to date: It was right after the fall of Barcelona in February 1939. The article was about what seemed to be the inexorable spread of fascism over the world. In 1938, Austria had been annexed by Nazi Germany. A few months later, Czechoslovakia was betrayed, placed in the hands of the Nazis at the Munich Conference. In Spain, one city after another was falling to Franco’s forces. February 1939, Barcelona fell. That was the end of the Spanish Republic. The remarkable popular revolution, anarchist revolution, of 1936, ’37, ’38, had already been crushed by force. It looked as if fascism was going to spread without end. It’s not exactly what’s happening today, but, if we can borrow Mark Twain’s famous phrase, “History doesn’t repeat but sometimes rhymes.” Too many similarities to overlook. When Barcelona fell, there was a huge flood of refugees from Spain. Most went to Mexico, about 40,000. Some went to New York City, established anarchist offices in Union Square, secondhand bookstores down 4th Avenue. That’s where I got my early political education, roaming around that area. That’s 80 years ago. Now it’s today. We didn’t know at the time, but the U.S. government was also beginning to think about how the spread of fascism might be virtually unstoppable. They didn’t view it with the same alarm that I did as a 10-year-old. We now know that the attitude of the State Department was rather mixed regarding what the significance of the Nazi movement was. Actually, there was a consul in Berlin, U.S. consul in Berlin, who was sending back pretty mixed comments about the Nazis, suggesting maybe they’re not as bad as everyone says. He stayed there until Pearl Harbor Day, when he was withdrawn—famous diplomat named George Kennan. Not a bad indication of the mixed attitude towards these developments. It turns out, couldn’t have known it at the time, but shortly after this, 1939, the State Department and the Council on Foreign Relations began to carry out planning about the postwar world, what would the postwar world look like. And in the early years, right about that time, next few years, they assumed that the postwar world would be divided between a German-controlled world, Nazi-controlled world, most of Eurasia, and a U.S.-controlled world, which would include the Western Hemisphere, the former British Empire, which the U.S. would take over, parts of the Far East. And that would be the shape of the postwar world. Those views, we now know, were maintained until the Russians turned the tide. Stalingrad, 1942, the huge tank battle at Kursk, a little later, made it pretty clear that the Russians would defeat the Nazis. The planning changed. Picture of the postwar world changed, went on to what we’ve seen for the last period since that time. Well, that was 80 years ago. Today we do not—we are not facing the rise of anything like Nazism, but we are facing the spread of what’s sometimes called the ultranationalist, reactionary international, trumpeted openly by its advocates, including Steve Bannon, the impresario of the movement. Just had a victory yesterday: The Netanyahu election in Israel solidified the reactionary alliance that’s being established, all of this under the U.S. aegis, run by the triumvirate, the Trump-Pompeo-Bolton triumvirate—could borrow a phrase from George W. Bush to describe them, but, out of politeness, I won’t. The Middle East alliance consists of the extreme reactionary states of the region—Saudi Arabia, United Arab Emirates, Egypt under the most brutal dictatorship of its history, Israel right at the center of it—confronting Iran. Severe threats that we’re facing in Latin America. The election of Jair Bolsonaro in Brazil put in power the most extreme, most outrageous of the right-wing ultranationalists who are now plaguing the hemisphere. Yesterday, Lenín Moreno of Ecuador took a strong step towards joining the far-right alliance by expelling Julian Assange from the embassy. He’s picked up quickly by the U.S., will face a very dangerous future unless there’s a significant popular protest. Mexico is one of the rare exceptions in Latin America to these developments. This has happened—in Western Europe, the right-wing parties are growing, some of them very frightening in character. There is a counterdevelopment. Yanis Varoufakis, the former finance minister of Greece, a very significant, important individual, along with Bernie Sanders, have urged the formation of the Progressive International to counter the right-wing international that’s developing. At the level of states, the balance looks overwhelmingly in the wrong direction. But states aren’t the only entities. At the level of people, it’s quite different. And that could make the difference. That means a need to protect the functioning democracies, to enhance them, to make use of the opportunities they provide, for the kinds of activism that have led to significant progress in the past could save us in the future. I want to make a couple of remarks below about the severe difficulty of maintaining and instituting democracy, the powerful forces that have always opposed it, the achievements of somehow salvaging and enhancing it, and the significance of that for the future. But first, a couple of words about the challenges that we face, which you heard enough about already and you all know about. I don’t have to go into them in detail. To describe these challenges as “extremely severe” would be an error. The phrase does not capture the enormity of the kinds of challenges that lie ahead. And any serious discussion of the future of humanity must begin by recognizing a critical fact, that the human species is now facing a question that has never before arisen in human history, question that has to be answered quickly: Will human society survive for long? Well, as you all know, for 70 years we’ve been living under the shadow of nuclear war. Those who have looked at the record can only be amazed that we’ve survived this far. Time after time it’s come extremely close to terminal disaster, even minutes away. It’s kind of a miracle that we’ve survived. Miracles don’t go on forever. This has to be terminated, and quickly. The recent Nuclear Posture Review of the Trump administration dramatically increases the threat of conflagration, which would in fact be terminal for the species. We may remember that this Nuclear Posture Review was sponsored by Jim Mattis, who was regarded as too civilized to be retained in the administration—gives you a sense of what can be tolerated in the Trump-Pompeo-Bolton world. Well, there were three major arms treaties: the ABM Treaty, Anti-Ballistic Missile Treaty; the INF Treaty, Intermediate Nuclear Forces; the New START treaty. The U.S. pulled out of the ABM Treaty in 2002. And anyone who believes that anti-ballistic missiles are defensive weapons is deluded about the nature of these systems. The U.S. has just pulled out of the INF Treaty, established by Gorbachev and Reagan in 1987, which sharply reduced the threat of war in Europe, which would very quickly spread. The background of that signing of that treaty was the demonstrations that you just saw depicted on the film. Massive public demonstrations were the background for leading to a treaty that made a very significant difference. It’s worth remembering that and many other cases where significant popular activism has made a huge difference. The lessons are too obvious to enumerate. Well, the Trump administration has just withdrawn from the INF Treaty; the Russians withdrew right afterwards. If you take a close look, you find that each side has a kind of a credible case saying that the opponent has not lived up to the treaty. For those who want a picture of how the Russians might look at it, the Bulletin of Atomic Scientists, the major journal on arms control issues, had a lead article a couple weeks ago by Theodore Postol pointing out how dangerous the U.S. installations of anti-ballistic missiles on the Russian border—how dangerous they are and can be perceived to be by the Russians. Notice, on the Russian border. Tensions are mounting on the Russian border. Both sides are carrying out provocative actions. We should—in a rational world, what would happen would be negotiations between the two sides, with independent experts to evaluate the charges that each is making against the other, to lead to a resolution of these charges, restore the treaty. That’s a rational world. But it’s unfortunately not the world we’re living in. No efforts at all have been made in this direction. And they won’t be, unless there is significant pressure. Well, that leaves the New START treaty. The New START treaty has already been designated by the figure in charge, who has modestly described himself as the greatest president in American history—he gave it the usual designation of anything that was done by his predecessors: the worst treaty that ever happened in human history; we’ve got to get rid of it. If in fact—this comes up for renewal right after the next election, and a lot is at stake. A lot is at stake in whether that treaty will be renewed. It has succeeded in very significantly reducing the number of nuclear weapons, to a level way above what they ought to be but way below what they were before. And it could go on. Well, meanwhile, global warming proceeds on its inexorable course. During this millennium, every single year, with one exception, has been hotter than the last one. There are recent scientific papers, James Hansen and others, which indicate that the pace of global warming, which has been increasing since about 1980, may be sharply escalating and may be moving from linear growth to exponential growth, which means doubling every couple of decades. We’re already approaching the conditions of 125,000 years ago, when the sea level was about roughly 25 feet higher than it is today, with the melting, the rapid melting, of the Antarctic, huge ice fields. We might—that point might be reached. The consequences of that are almost unimaginable. I mean, I won’t even try to depict them, but you can figure out quickly what that means. Well, meanwhile, while this is going on, you regularly read in the press euphoric accounts of how the United States is advancing in fossil fuel production. It’s now surpassed Saudi Arabia. We’re in the lead of fossil fuel production. The big banks, JPMorgan Chase and others, are pouring money into new investments in fossil fuels, including the most dangerous, like Canadian tar sands. And this is all presented with great euphoria, excitement. We’re now reaching energy independence. We can control the world, determine the use of fossil fuels in the world. Barely a word on what the meaning of this is, which is quite obvious. It’s not that the reporters, commentators don’t know about it, that the CEO of the banks don’t know about it. Of course they do. But these are kind of institutional pressures that just are extremely hard to extricate themselves from. You can put yourself in the—try to put yourself in the position of, say, the CEO of JPMorgan Chase, the biggest bank, which is spending large sums in investment in fossil fuels. He certainly knows everything that you all know about global warming. It’s no secret. But what are the choices? Basically he has two choices. One choice is to do exactly what he’s doing. The other choice is to resign and be replaced by somebody else who will do exactly what he’s doing. It’s not an individual problem. It’s an institutional problem, which can be met, but only under tremendous public pressure. And we’ve recently seen, very dramatically, how it can—how the solution can be reached. A group of young people, Sunrise Movement, organized, got to the point of sitting in in congressional offices, aroused some interest from the new progressive figures who were able to make it to Congress. Under a lot of popular pressure, Alexandria Ocasio-Cortez, joined by Ed Markey, actually placed the Green New Deal on the agenda. That’s a remarkable achievement. Of course, it gets hostile attacks from everywhere: It doesn’t matter. A couple of years ago it was unimaginable that it would be discussed. As the result of the activism of this group of young people, it’s now right in the center of the agenda. It’s got to be implemented in one form or another. It’s essential for survival, maybe not in exactly that form, but some modification of it. Tremendous change achieved by the commitment of a small group of young people. That tells you the kind of thing that can be done. Meanwhile, the Doomsday Clock of the Bulletin of Atomic Scientists last January was set at two minutes to midnight. That’s the closest it’s been to terminal disaster since 1947. The announcement of the settlement—of the setting mentioned the two major familiar threats: the threat of nuclear war, which is increasing, threat of global warming, which is increasing further. And it added a third for the first time: the undermining of democracy. That’s the third threat, along with global warming and nuclear war. And that was quite appropriate, because functioning democracy offers the only hope of overcoming these threats. They are not going to be dealt with by major institutions, state or private, acting without massive public pressure, which means that the means of democratic functioning have to be kept alive, used the way the Sunshine Movement did it, the way the great mass demonstration in the early ’80s did it, and the way we continue today. After Lula’s—after he left office, a kind of a “soft coup” take place—I won’t go through the details, but the last move, last September, was to take Lula da Silva, the leading, the most popular figure in Brazil, who was almost certain to win the forthcoming election, put him in jail, solitary confinement, essentially a death sentence, 25 years in jail, banned from reading press or books, and, crucially, barred from making a public statement—unlike mass murderers on death row. This, in order to silence the person who was likely to win the election. He’s the most important political prisoner in the world. Do you hear anything about it? Like, take the trade agreements with China. OK? What are the trade agreements about? They’re an effort to prevent China’s economic development. It’s exactly what they are. Now, China has a development model. The Trump administration doesn’t like it. So, therefore, let’s undermine it. Ask yourself: What would happen if China did not observe the rules that the United States is trying to impose? China, for example, when Boeing or Microsoft, some other major company, invests in China, China wants to have some control over the nature of the investment. They want some degree of technology transfer. They should gain something from the technology. Is there something wrong with that? That’s how the United States developed, stealing—what we call stealing—technology from England. It’s how England developed, taking technology from more advanced countries—India, the Low Countries, even Ireland. That’s how every developed country has reached the stage of advanced development. If Boeing and Microsoft don’t like those arrangements, they don’t have to invest in China. Nobody has a gun to their heads. If anybody really believed in capitalism, they should be free to make any arrangement they want with China. If it involves technology transfer, OK. The United States wants to block that, so China can’t develop. Take what are called intellectual property rights, exorbitant patent rights for medicines, for Windows, for example. Microsoft has a monopoly on operating systems, through the World Trade Organization. Suppose China didn’t observe these. Who would benefit, and who would lose? Well, the fact of the matter is that consumers in the United States would benefit. It would mean that you’d get cheaper medicines. It would mean that when you get a computer, that you wouldn’t be stuck with Windows. You could get a better operating system. Bill Gates would have a little less money. The pharmaceutical corporations wouldn’t be as super-rich as they are, a little less rich. But the consumers would benefit. Is there something wrong with that? Is there a problem with that? Well, you might ask yourself: What lies behind all of these discussions and negotiations? This is true across the board. Almost any issue you pick, you can ask yourself: Why is this accepted? So, in this case, why is it acceptable for the United States to have the power to even begin to give even a proposal to extradite somebody whose crime is to expose to the public materials that people in power don’t want them to see? That’s basically what’s happening. AMY GOODMAN: Noam, what about what’s happened in Israel, Prime Minister Netanyahu winning a record fifth term? Right before the election, he announces that he will annex illegal Israeli settlements in the occupied West Bank. Last month, Trump officially recognized Israeli sovereignty over the Golan Heights. NOAM CHOMSKY: Well, first of all, if Benny Gantz had been elected instead of Netanyahu, the difference would not be very great. The difference between the two candidates is not substantial in terms of policy. Netanyahu—here’s another example of the extraterritorial reach of the United States. Netanyahu is somewhat more extreme. The United States desperately wanted him to be elected. And the Trump administration has been giving gift after gift to Netanyahu to try to get him elected. It was enough to carry him over the roughly 50/50—close to 50/50 election. One of them, of course, was to move the embassy to Jerusalem, in violation of not only international law, but even Security Council resolutions that the U.S. had participated in. A very dramatic change. A second, equally dramatic, was to authorize Israeli annexation of the Golan Heights. The Syrian Golan Heights are, under international law, occupied territory. Israel—every major institution, every relevant institution, Security Council, International Court of Justice, all agree on this. Israel did formally annex the Golan Heights. But the Security Council, U.N. Security Council, with the U.S. participating, declared that null and void. OK? Trump unilaterally reversed it—another gift to Netanyahu, saying, try to demonstrate to the Israeli public that, with U.S. backing, he can get anything they want. The last was Trump’s latest, just before the election, his declaration that, if elected, he would annex parts of the West Bank. That was with tacit U.S. authorization. These are strong measures that were taken to interfere radically with a foreign election. Have you heard something about how terrible it is to interfere in foreign elections? I think maybe that you noticed that somewhere. Here, it’s done radically. It’s considered fine. But exactly what are the actual consequences of that in terms of the way policy has been evolving? Fact of the matter is, not much. So, take the annexation of the Golan Heights. In fact, it was declared null and void by the Security Council. It was condemned by the International Court of Justice. But did anybody do anything about it? Has any move been made to prevent Israel’s development of the Golan Heights, establishment of settlements, enterprises, development of ski resorts on Mount Hermon? Anything? No, nobody lifted a finger. And nobody lifted a finger for a simple reason: The U.S. won’tallow it. Nobody says that, but that’s the fact. Well, now it’s formally authorized, instead of just happening. Take Netanyahu’s proposal to annex parts of the West Bank. That’s been going on for 50 years, literally. Right after the ’67 war, both political parties, both major groupings in Israel—the former Labor-based party, the Likud-based conglomerate—they have slightly different policies, but essentially they have been carrying out a development program in the West Bank which is geared towards the goal, the very clear goal, of creating what will be a kind of Greater Israel, in which Israel will take over whatever is of value in the West Bank, leave the Palestinian population concentrations—like in Nablus and Tulkarm—leave them isolated. In the rest of the region, there are maybe 150 or so little Palestinian enclaves, more or less surrounded by checkpoints, often separated from their fields, able to survive, but barely. Meanwhile, Jewish settlements are developed. Cities have been constructed—a major city, Ma’ale Adumim, constructed mostly under Clinton, incidentally, under the Clinton years, east of Jerusalem. The road to it essentially bisects the West Bank. Further ones up north. Jerusalem itself is maybe five times the size of what it ever was historically. All of these are linked by highly developed infrastructure projects. You can take a trip. You can—this is basically creating pleasant suburbs of Tel Aviv and Jerusalem in the West Bank. You can travel from Ma’ale Adumim to Tel Aviv on a big highway, restricted to Israelis and tourists, not Palestinians, more easily than you can get from the South Shore to Boston—never seeing an Arab. All of this has been steadily developed, year after year, with tacit U.S. support. U.S. provides the diplomatic support, a lot of the economic support, the military aid. And meanwhile, the government says, “We don’t like it. Stop doing it,” but providing the means for it. Well, the only difference in Netanyahu’s statement with Trump’s tacit backing is, “I’m going to go ahead and annex it, annex all of this, instead of just developing it, subject to eventual annexation.” These are the real things that have been happening. Now, the Netanyahu victory, as I mentioned before, solidifies an alliance that is being—that has been developed, that’s been—parts of it have been kind of undercover for years, not formal, but functioning, now coming into the open, of the most reactionary Arab states—primarily Saudi Arabia, one of the most reactionary states in the world; Egypt, under the Sisi dictatorship, the worst dictatorship in Egypt’s history; the United Arab Emirates, similar; Israel, right in the center of it. It’s part of the international right-wing alliance system, the international reactionary, ultranationalist alliance system that’s taking shape with the U.S. leadership, a kind of a new global system that’s developing. South America, under Bolsonaro, is another part of it. AMY GOODMAN: And yet, in the United States, there’s this growing awareness. For example, the Democratic-Republican vote against Saudi Arabia-UAE’s war in Yemen, fueled by the United States. Does that give you hope? NOAM CHOMSKY: That’s a very interesting development. That’s actually Bernie Sanders. It’s what—and notice—and it is a very important development, but let’s notice what happened. The Saudi-United Arab Emirate war in Yemen has been a hideous atrocity. There’s probably—nobody knows—maybe 60,000, 70,000 people killed, half the population barely surviving. The U.N. describes it as the worst humanitarian disaster in the world. It’s a real monstrosity. It’s been going on year after year, using—Saudi Arabia, UAE are using U.S. weapons—secondarily, British weapons—U.S. intelligence support, U.S. intelligence directly working closely with the Saudis to target bombing and so on and so forth. All of this has been happening with no protest. Then came the Khashoggi killing, brutal killing of a journalist for The Washington Post. That caused outrage. OK? It should have, but, you know, that’s not the reason why the Yemen war should have suddenly had the spotlight shined on it. But it was. Then Bernie Sanders came along, with a couple of others, and initiated the legislation, which put some crimps in the direct U.S. support for the war. Which is significant, but we should put it in the context of what in fact happened. And I think we can be pretty confident that the Trump-Pompeo-Bolton triumvirate will find a way around it and keep the war going—unless the public seriously protests. Now, there is something else that’s worth paying attention to. The support for Israeli expansionism, repression, the whole alliance that’s developing, that support has shifted in the United States from the more liberal sectors—roughly, the Democratic Party—to the far right. Not very long ago, support for Israel was based passionately in the liberal sectors of the population. It was a Democratic issue. It isn’t anymore. In fact, if you look in the polls, people who identify themselves as Democrats by now tend to support Palestinian rights more than Israel. That’s a dramatic change. Support for Israel now is in the most reactionary parts of the population: evangelical Christians, ultranationalists. Basically, it’s a far-right issue. Among younger people, this is even more the case. I mean, I can see it myself, just in my own personal experience. Up until about maybe 10 or 15 years ago, if I was giving a talk at a university on Israel-Palestine, even my own university, MIT, I had to have police protection, literally. Police would try to prevent the meeting from being broken up. They wouldn’t let me walk to my car alone. I had to be accompanied by police. Meetings were broken up. Nobody was objecting to any this. It was happening all the time. That’s changed totally. And it’s a very significant change. I think that sooner or later—I hope sooner—this may lead to a shift in U.S. policy. There are some very simple moves that could be made in U.S. policy that would change the situation in the Middle East dramatically. So, for example, one simple proposal is that the United States government should live up to U.S. law. That doesn’t sound too dramatic. The United States has laws, like the so-called Leahy Law, Patrick Leahy Law, which requires that no military aid can be given to any military organization that is involved in systematic human rights abuses. Well, the Israeli army is involved in massive human rights abuses. If the U.S. were to live up to U.S. law, we would cut off aid to the IDF, the Israeli army. That step alone would have a major effect, not just the material aid, but the symbolic meaning of it. And it’s quite possible that with the shift of public opinion, especially among younger people, there might come a point when there will be a call for the United States to follow its own laws. OK? Again, not a very dramatic appeal. And it wouldn’t even be breaking new ground. AMY GOODMAN: Noam Chomsky. We spoke at the Old South Church Thursday night. He was visiting his longtime home of Boston. He was a professor at the Massachusetts Institute of Technology for over 50 years. At the end of the event, we celebrated his 90th birthday. Posted on Democracy Now and Z Communications, April 13, 2019.